I don't usually get star-struck, though there have been three exceptions*: Steve Nash, Stringer Bell (I mean Idris Elba. For the love of god don't repeatedly call him String!) and Mark Tewksbury. I was obsessed during the 1992 Olympics in Barcelona and Mark Tewksbury's gold medal race blew my 12-year-old mind. I could watch that clip over and over again and every time I will get goosebumps and every time I will get happy tears in my eyes. That start? Come on. And that huge smile, his disbelief and sheer joy, those fists in the air. I cut out every single newspaper article I could find about Mark Tewksbury and created quite a formidable scrapbook. 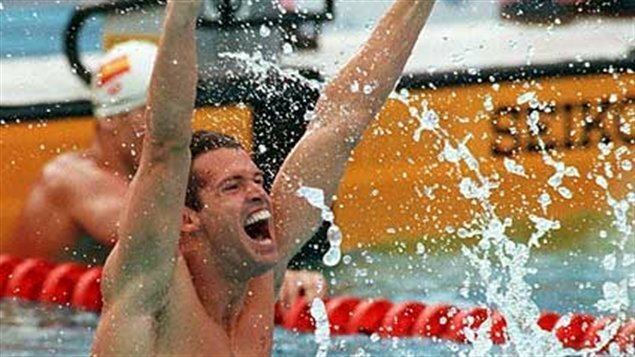 I fell in love with back stroke because of Mark Tewksbury. And the day he won, I also had a race (with my summer rec swim team, the Park Lawn Piranhas). And when I won that afternoon, I truly felt Mark Tewksbury and I were kindred spirits. Fast forward a lot of years. I was 19 and in dance school and horribly injured. I went to physio nearly every day, with the words "hip surgery" bandied about with alarming frequency. The only consolation about spending every day in physio was that it was next to a Starbucks and I would treat myself to a vanilla latte – a financial extravagance for a broke contemporary dance student – and sit on the top floor, by the window and try not to cry. In retrospect, it was one of the lowest places I have been. One afternoon, a man walked in. And I knew him. At least I thought I knew him. It was Mark Tewksbury. And because when it is Steve Nash, Stringer Bell or Mark Tewksbury, I cannot contain myself, I literally ran over to him and everything tumbled out – the scrapbook, his race, his joy, the race I swam and won, that I've had truly believed we were kindred spirits, all of it. And that lovely, wonderful, gracious man smiled and listened and then asked if I wanted a hug. Even thinking about it now brings tears to my eyes. Turns out I didn't need surgery (helloooooo, second opinion!) and the following year I started swimming again and every time the lane was quiet enough, I'd do back crawl and think of meeting Mark Tewksbury in that Starbucks – his kindness, his empathy, his lack of judgment, his generosity. He is truly an exceptional human being – an activist, an advocate, the biggest fan of Canadian athletes. (Have you seen this? Of course you have. I've been watching it multiple times a day. It's simply the best). I never want the Olympics to end for a lot of reasons, but mostly because I love seeing Mark Tewksbury on CBC these days. The world is a better place with him in it.